From this angle you can probably figure out the challenges of parking, mounting and dismounting. You may recall that I shortened the kickstand about 1/2″ as the DR650 not only stands too straight up, but it has a soft suspension, so when weighted with the suspension compressed it stands even more straight. Shortening the kickstand increased the lean to the left, keeping the bike from teetering and making mounting and dismounting easier. Easier may not be the right word. Possible is more like it. 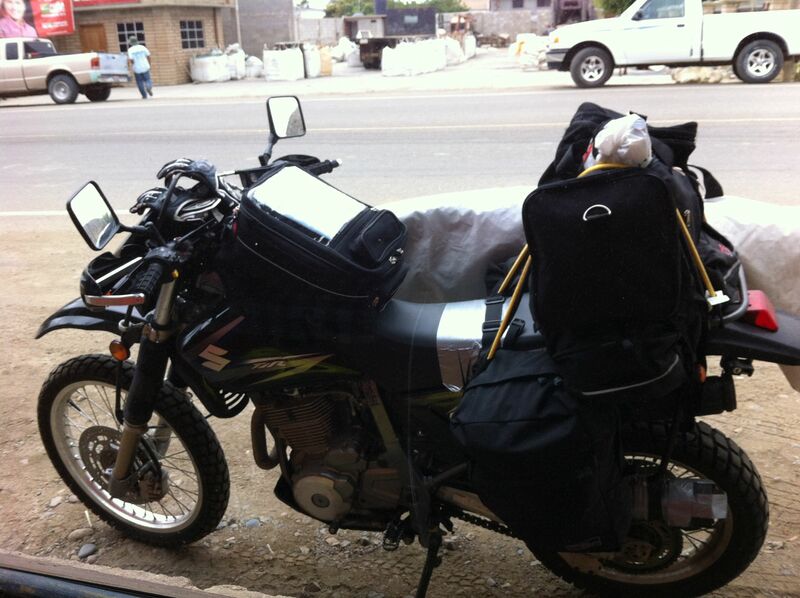 In this shot you can start to see a few of the challenges – the narrow sitting space (not as big of a problem as it seems here), the rear luggage preventing me from mounting the bike by swinging a leg over the rear, and the surfboard further limiting mounting space. What you can’t see is that with the weight of the baggage, the bike is near teetering, so I always had to find parking that sloped slightly downhill to the left, to add lean. Parked on the right ground, mounting and dismounting can begin. See that duct tape on the seat? That’s not a repair. It’s there to prevent scratching or tearing. To mount, I needed to lift my (heavily booted) right leg onto the seat, then slide it down into the space between the surfboard and the bike, aiming to plant my foot on the ground. I needed to do this in one smooth motion, because as I slipped onto the bike the bike would move more upright, the suspension would compress more, and momentum would push the lean to the right side, so my foot had to get planted quickly. So it was a 2-step deal: Lift right boot onto seat, then slip over and plant right foot solidly on the ground. Dismounting was just as strange, perhaps stranger. First, stand on pegs, weighting on the left. Second, lift right boot up and onto the seat, so I was now standing with one foot on the left peg and the other on the seat. Third, pull right boot up off the seat and onto the ground. Remove left foot. Why not one smooth motion? The distance between the pegs and the seat combined with the bulk of a solid off-road boot (Moose Racing M1 boot – great value for an excellent, heavy-duty boot) made it near impossible to complete that move in one step without dragging the boot across the seat, risking tears from the boot sole. Also, this was a good test of the stability of the parking spot. Sounds like a lot of work, and it was at first, but you get the hang of it. The toughest part was the first time I did it, which was when I pulled the fully-loaded bike out of my garage into the alley and fired her up for the trip. No practice run, so I wasn’t even sure if I could get on and off the bike! I was already sweating as I pulled away. The adventure started right then and there.